In 1985 the State of Hawai`i named Herb Kawainui Kane "a living treasure". 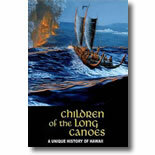 "Children Of The Long Canoes" presents the incredible story of the first Hawaiians as seen through the eyes of this brilliant artist-historian. See it as it was during the polynesian's daring voyage of discovery and how they lived life in harmony with nature in this isolated island paradise. The DVD explores the laws of Kapu (taboo) and fascinating myths and mysterious gods.